Kleine Flötenuhren sind um und nach 1790 in Wien in Mode gekommen. Haydn, Mozart und Beethoven haben spezielle Stücke komponiert und damit den neuartigen Spielwerken ein außerordentliches künstlerisches Niveau vorgegeben. In zahlreichen Arrangements wurden die beliebtesten Nummern aus den damals gängigen Opern und Balletten auf die Walzen der Flötenuhren gesetzt, die somit den musikalischen Geschmack der damaligen Zeit bewahrt haben. Die CD macht einen Teil des Repertoires der frühen Wiener Flötenuhr zugänglich. Die getroffene Auswahl an Musikstücken gibt einen Überblick über die Favoritstücke aus Opern und Balletten, sie vermittelt den Eindruck über die Tanzmusik dieser Zeit, und sie stellt einige Stücke vor, die die virtuose Seite des Automaten besonders gut zur Geltung bringt: Variationenwerke und Fantasien eigneten sich für diesen Zweck ganz besonders. Der Bereich der Originalkompositionen ist u.a. mit den 12 Stücken von Haydn vertreten, die von der Flötenuhr des P. Primitivus Niemecz gespielt werden, die aus dem Jahr 1792 stammt. It was in about 1790 that mechanical organ works first became known in Vienna. Even the earliest reports state that such instruments were incorporated into clocks as well as other pieces of furniture. The smaller flute clock, however, went out of fashion rather quickly, apparently being replaced by the smaller barrel organs which are associated with clocks belong to the early days of this type of automata. The present CD is dedicated to these instruments. This type of Viennese flute clock was made only as a mantle clock. The small organ work with its pipes, bellows, windchest, gear and barrel is housed within the case of the clock or in a small box which serves as a base for the clock. The flute clocks are fusee-driven, the speed being regulated by the fan. In musical respects the Viennese flute clock had a marvellous start. Haydn, Mozart and Beethoven composed especially for this kind of automata, thereby establishing an extraordinarily high standard. Certainly this fact has to be considered as one of the reasons for the high social prestige of the flute clocks, making them a most fashionable and luxurious article. Most flute clocks did not play original compositions but rather the well-known and favourite tunes of their time. Accordingly, the CD presents melodies from operas and ballets as well as some dance music. 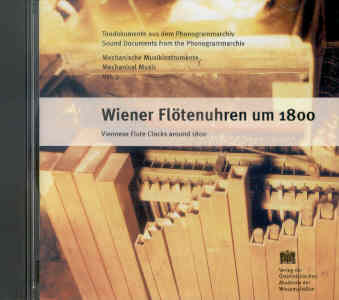 With regard to original compositions this CD incorporates also all of Haydns pieces played by the flute clock made by P. Primitivus Niemecz in 1792.